Gravity, the new space thriller starring George Clooney and Sandra Bullock, is being hailed as one of the greatest movies of modern science-fiction. The film, however, has a stronger basis in fact than you might imagine. One of the main antagonists of the film is a cloud of space debris orbiting the Earth at tremendous speeds, decimating anything in its path, including the International Space Station. Though dramatized in the movie, space junk does pose a real threat to existing satellite systems and has the potential to put future flights at risk. The number of satellites currently in orbit is staggering. There have been some 5,000 satellite launches to date, and the potential for their orbits to become congested will only increase as that number climbs. Modern society now depends on satellites for a large number of essential services like communications, weather forecasting, navigation, television and scientific research. The vast majority of these are concentrated in low Earth orbit (an altitude between 160 and 2,000 km) near the poles, where roughly two-thirds of all known artificial objects can be found. Experts project an exponential increase in the number of artificial objects in orbit throughout the rest of the century. A map of the debris clouds just after the Irrium 33/Cosmos 2251 collision (Credits: Celestrak/AGI Viewer 9). Composed of spent rockets, dead satellites and fragments from previous collisions, the debris cloud currently in Earth’s orbit has become a major concern among space officials in recent years. There are currently some 17,000 artificial objects in orbit being monitored, 10,000 of which are fragments created by explosions or collisions. NASA, however, estimates that there are around 500,000 pieces of space debris larger than a marble, 22,000 as large as a softball and potentially hundreds of millions of pieces at least 1 mm in diameter. Even these tiny fragments have the potential to knock out one of the 1,000 or so operational satellites currently in orbit and generate even more debris. For example, the thought of an errant piece of junk, no larger than a marble, striking a GPS Block IIR(M) satellite and disrupting critical GPS systems or compromising something like HughesNet’s EchoStar XVII and blacking out internet service to an entire region has generated a significant amount of concern. Collision warnings for operational satellites are on the rise and roughly 10 objects pass within two kilometers of vital communication satellites every week. There have already been several major collisions in low Earth orbit. The most significant event occurred in 2009 when a defunct Russian satellite, Cosmos 2251, slammed into an active U.S. communications satellite traveling at 42,000 km/hour. The incident resulted in the creation of an extra 2,000 items of space junk. A similar incident was narrowly avoided in 2012 when a dead Cold-War spy satellite and a NASA satellite were expected to pass within 213 m of one another. The collision was averted when the Fermi Gamma-ray Space Telescope engaged its thrusters briefly to give the two objects a wider berth of six miles. 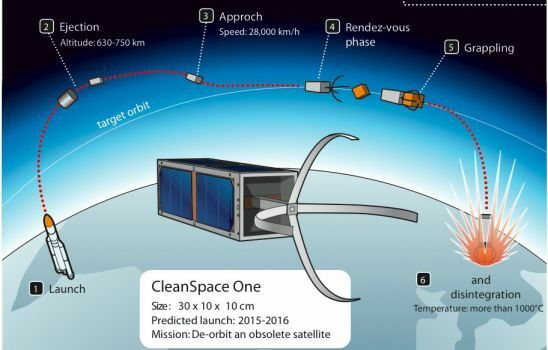 Missions like Clean Space One aim to actively remove debris (Credits: Swiss Space Center). So what can be done to combat the threat of space junk to the satellites we depend on? One solution looks at the fact that most of the debris in orbit is the direct result of accidental explosions due to unspent fuel resources. By venting pressure tanks, depleting all fuel reserves and turning off battery connections, dead satellites would remain intact and would be easier to remove from orbit. Satellites could also be removed from high traffic orbits while they can still be maneuvered, gradually reducing their altitude until they reenter Earth’s atmosphere. The third solution calls for active removal of uncontrollable objects using retrieval craft. These would attach to dead satellites or larger debris using robotic arms or by deploying special nets and could then induce a controlled reentry using powerful thrusters. Whichever solution turns out to be most effective, the message from the scientific community is clear: something has to be done. Though catastrophic events like those portrayed in Gravity are still fiction for now, the dangers posed by uncontrollable space junk to satellites, unmanned missions, and manned space flights will only increase as humanity sends more and more objects up into orbit. Image caption: Gravity’s Dr. Ryan Stone (Sandra Bullock) takes respite in a Soyuz (Credits: Warner Bros.). The article does not support the headline. Nothing particularly wrong in the article, but it does not address the plausibility of the film. The events in the film are implausible and greatly improbable. (Anything is possible.) We in the space safety community should not amplify what is already a serious concern. There are unintended consequences. For example, Governments could decide that the ISS is just took risky and shut it down. the examples are also off the mark. GPS (and other constellations) are very robust. Losing one or even a few satellites does not reduce them to nothingness. In fact, it is required that a sufficient service be sustained despite such events. Internet service would not be blacked out either if an Echostar satellite were lost. You would not believe what the commsat operators do to sustain service despite interference and anomalies. Such an article in our publication deserves greater research and authentication. Are these pieces reviewed by any of the technical experts in IAASS?